The majority of insurance providers will advise that you keep any valuables out of sight. According to Aviva you should be aware of any ‘top pickings’ for burglars; “consoles, games and DVDs make up 62% of belongings stolen”, “other favourites include cameras, computers, mobile phones, MP3 players and jewellery” (Aviva). Many Police Forces across the UK are advising against leaving valuables on view in your home especially presents. Some Police Forces are even using Christmas cards to get this across as you can see from the image below, which basically demonstrates how presents or valuables on show can be window shopping for a burglar. Tameside Homewatch has urged local residents to not only keep valuables out of sight but also if possible safely lock them away in a drawer or cabinet. 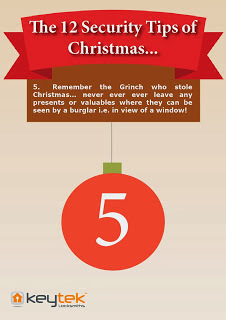 So remember don’t leave any valuables on view and don’t make it a happy Christmas for burglars!